The arrival of fall means a lot of things. It means that the leaves are about to start changing colors and falling from the trees. It means that popular holidays like Halloween and Thanksgiving are drawing nearer. And it also means that the warmth and sunshine of summer will start to fade away, being replaced by cooler temperatures all around the United States. However, even though the weather gets a little chillier at this time of year, it doesn’t mean that there aren’t plenty of reasons to head outdoors and have fun with family and friends. One of the most popular activities during the months of fall is apple picking. There’s nothing quite as relaxing and enjoyable as walking around orchards for a few hours, taking in the scenery and getting in touch with nature while filling up bags and boxes of fresh, delicious apples. Apples can be used for all kinds of recipes like pies and donuts and ciders, or simply munched on as a tasty and healthy snack. They’re one of America’s favorite fruits, and New York is one of the best spots to go apple picking in all of North America. You don’t even need to leave New York City to enjoy awesome apple picking. A lot of great orchards and U-Pick locations can be found right on Long Island. These locations run apple picking services from late summer all through fall, and many of them also provide additional fun and games like hayrides and corn mazes too. 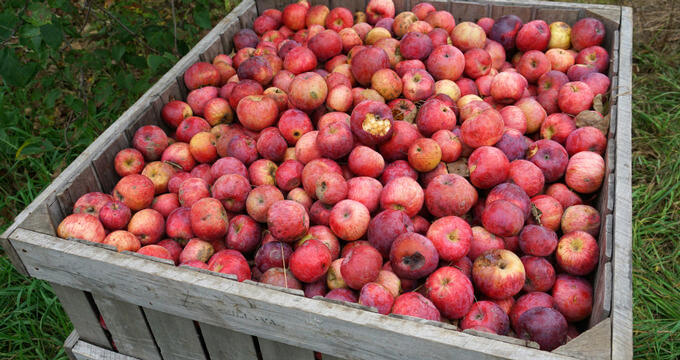 Here are some more details and overviews of the best apple picking locations on Long Island. Conveniently located for anyone in the western side of Long Island, Woodside Orchards is a friendly, family-owned and operated orchard that has been serving Long Island for a few decades now. This is one of the best Long Island apple picking locations for people who like a lot of variety, with more than 30 different apple varieties being grown at Woodside. There's also a farm store selling homemade honey, cider, apple wine, and baked goods. Despite being named in honor of the iconic Halloween symbol, Hank's Pumpkintown is also an excellent Long Island apple picking spot. Open every day through fall, this location offers a nice range of tasty apples like Honeycrisp, McIntosh, and others, along with kid-friendly activities like train rides, face painting, corn mazes, play areas, and more. If you're looking to do some apple picking with young children, this is definitely one of the better spots in Long Island. There's even a little mining play area where kids can dig for fossils and gemstones. If you're looking around Long Island for a friendly, authentic apple picking location, Seven Pounds Orchard is most definitely the place to be. The 'superdwarf' trees at this location are very low to the ground for all to enjoy and many additional activities can be found and enjoyed on site, including hayrides, corn mazes, play areas, and more. There's also a full market and picnic area where you can simply sit and enjoy some snacks while admiring the surrounding scenery. Offering some of the best and most varied apple picking in Long Island, this Riverhead location is another super spot for families to spend the day. Offering over 25 different apple varieties, all grown on dwarf trees that are the perfect size for little ones to get in on the fun, Harbes Orchard covers 70 acres of land. Peaches and other fruit can also be picked at this location throughout the year, and traditional activities like hayrides and corn mazes can be found on-site, as well as some more adult-oriented attractions like wine-tasting sessions and live music shows. Another lovely location in Long Island for apple picking and other fun fall activities, The Milk Pail is owned by the Halsey family, who have literally been farming and living off the land for over three centuries! The Milk Pail itself has been running since 1969 and was originally named for the milk that was sold there, but has grown into one of Long Island's top apple orchards in the years that followed.